The muscular looking Storme is a classy SUV of which the facelifted version has been launched with minor updates. 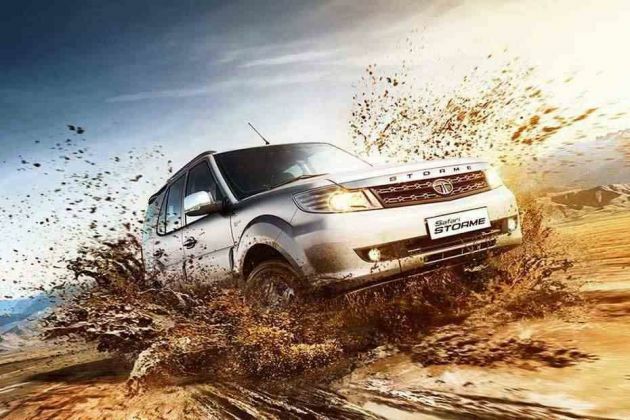 It is available with the same lineup, of which, Tata Safari Storme EX is the mid range trim. It has the same overall body structure like the outgoing version. Its exteriors have been modified by a re-designed radiator grille and bumper, which gives it a refreshed look. Now it also gets 'Storme' lettering on the hood in black color that creates a swish effect. At the same time, its internal cabin has also been updated with a Java black color scheme, which is highlighted by warm silver accents given on door handles and its dashboard. The company has also added ultrasonic parking sensors and CONNECTNEXT infotainment system by Harman that adds to the advantage. It also has a signature three spoke steering wheel that houses multifunctional switches on it for audio and call operation. However, the major update has been given to its engine that improves its overall power output and efficiency. The company has tuned its engine and now it can produce 10bhp extra power than its previous version. This vehicle will compete against the likes of Mahindra XUV500, Nissan Terrano, Renault Duster and others in this segment. The company's designers have left no stone unturned and have tried their best to make this latest SUV look urbane and outstanding. To begin with the frontage, it is equipped with a newly designed radiator grille with a lot of chrome treatment on it. It is embedded with a prominent company insignia in the center. This grille is flanked by a swept back designed headlight cluster, which is powered by high intensity lamps and side turn indicators. Just below this, it is designed with a body colored bumper houses a large air intake section for cooling the powerful engine. This air dam is flanked by a pair of bright fog lamps that adds to the visibility especially in bad weather conditions. The windscreen is made of toughened laminated glass and equipped with a couple of proficient intermittent wipers. Coming to its side profile, it is sleekly designed with body colored pull type door handles and ORVMs. The company has given electrically adjustment facility to these external wing mirrors and are integrated with side turn indicator. The neatly carved out wheel arches have been fitted with a classy set of 16-inch alloy wheels, which are covered with 235/70 R16 sized tubeless radial tyres. It also has side footsteps, which make it easier for passengers to come in and exit. The rear end is designed with a radiant tail light cluster, which is incorporated with halogen based reverse and brake lights along with turn indicator. It also has tail pipes, a sporty rear spoiler with a high mounted stop lamp and a set of roof rails as well. The spacious internal cabin of this sports utility vehicle is designed with java black color scheme, which is emphasized by chrome and wood inserts. In terms of seating, it is incorporated with well cushioned seats, which are further covered with premium upholstery that gives the occupants a plush feel while traveling. Its front row has two individual seats, whereas its second and third row has bench seats that can easily accommodate seven passengers. The rear seat can be folded, which helps in increasing the boot volume. The smooth dashboard is equipped with quite a few features like a large glove box, chrome accentuated AC vents, an advanced instrument panel and a three spoke steering wheel with company insignia in the center. The illuminated instrument cluster comes with adjustable light intensity function. It is equipped with a number of notifications, which are a low fuel warning light, digital tripmeter, outside temperature display, door ajar warning, driver seat belt reminder notification and several features as well. The company has also given a couple of 12V power socket in front and middle row for charging mobiles. This new version is also driven by the same 2.2-litre VARICOR diesel engine with a displacement capacity of 2179cc. But now it is slightly tuned to produce 10bhp extra power. It is integrated with sixteen valves and four cylinders with a DOHC based valve configuration. This engine has been fine tuned to generate lesser NVH (noise, vibration and harshness) and better fuel efficiency. With the help of a variable turbine technology based turbocharger, it can produce 148bhp of power output at 4000rpm in combination with a peak torque output of 320Nm in the range of 1700 to 2700rpm. This commanding diesel engine has been skillfully mated with a 5-speed manual transmission gear box, which distributes the torque output to its front wheels. The company has used double wish bone type of mechanism along with a coil spring over shock absorbers for its front axle. While the rear axle gets a 5-link suspension with coil springs, which assists to keep this massive SUV well balanced and stable. Its front and rear wheels are further fitted with a set of ventilated discs and conventional disc brakes. This braking mechanism is further augmented by ABS along with EBD. It also has a rack and pinion based hydraulic power steering system, which is quite responsive and supports a minimum turning radius of 10.8 meters. It is bestowed with a number of comfort features, which gives the occupants a pleasurable driving experience. The list includes an efficient air conditioning system along with roof mounted AC vents, power steering with mounted controls, all four power windows with driver side express down functions, power adjustable external rear view mirrors and many more such impressive features. It also has an advanced music system with ConnectNext screen by Harman. It supports CD/MP3 player, USB interface, Aux-in port and four speakers. In addition to these, it also has other aspects like cup and bottle holders in front console, front seat back pockets, sun glass holder, analog clock on center console, front seats with lumbar support, an ashtray and cigarette lighter in front console. The car manufacturer has given this variant a number of protective aspects. It has side impact bars on all the four doors and crumple zones, which absorbs the impact during collision to minimize the injuries. The seat belt are given for all passengers that reduce the impact in case any accidents. It also has driver seat belt reminder notification on instrument panel that helps in keeping the driver alert. It also has an engine immobilizer that helps to prevent an engine to start if a proper key is not used. Its rigid body structure has side impact bars along with crumple zones for protecting occupants inside the cabin in case of any collision. Apart from these, I has central locking system along with child safety rear door locks, motorized head lamps adjustment, door open warning and headlamps on key out warning. 1. Lavish interiors loaded with advanced comfort features. 2. Improved mileage and better power. 1. Acceleration can be made better. 2. Cost of ownership is rather expensive.